I don't know why but I'm not very good at making crepes. The first one I made with this recipe came out pretty good, but I completely destroyed the second one (it was too thick), and the last 3 were merely OK. Still, the results were pretty good and if you are a good crepemaker, you should try this. I used a whisk to mix the ingredients, but my food processor to mash the banana. I halved the recipe, and the one I made would be enough for 6 thinish crepes. Note that it's important to use a lot of oil or the crepes will stick to the pan. Also, the original recipe called for cooking the batter on one side only, but I was afraid it'd burn in the bottom and not cook enough on the top, so I flipped them halfway. I rolled the crepes to make them easier to eat. Mix flour, sugar and salt. Whisk in the milk, a little bit at the time. Add mashed bananas and mix well. Cover the bottom of a frying pan with oil, then pour a thin layer of batter. Cook until the edges start to crisp, about 2 minutes. Then flip and cook for another couple of minutes. 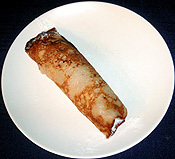 Dust with sugar, roll and serve.